Great for camping, tailgate parties, trips to the park and beach, flea markets, anywhere! Simply slide MotoBrella to your receiver hitch, insert your patio umbrella into the tube at the end of the bar, and boom…instant shade! It’s just that simple. The umbrella is held securely with no need for weight bags or ropes to tie it down. Simply attach it to your receiver hitch for instant shade and protection from the sun and rain. MotoBrella fits 2″ receiver hitch of any automobile with a tailgate, lift gate, or suv doors. It’s also very compact and easy to store in the bed of your truck or SUV, or even the trunk of your car, making it very easy to transport and set up anywhere. 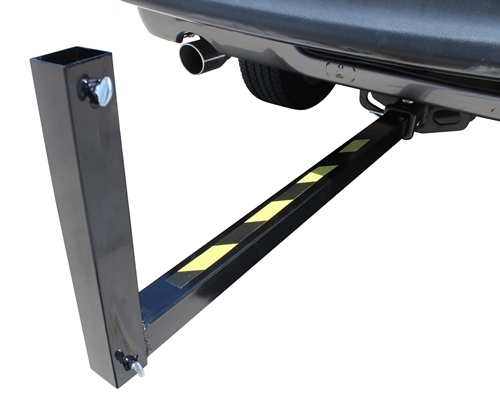 Simply attach it to your vehicle’s receiver hitch with a hitch pin, slip in an umbrella and tighten it down with the attached thumb screws. It really is that simple! And the umbrella won’t go anywhere…it’s secured to your vehicle, not to a table or stand that will blow over in the wind. Accepts poles up to 1.5″. SKU: 538. Categories: Beach Umbrella Anchors - For Tailgaiting, Beach Umbrella Anchors & Holders, Shade Products On Sale!.